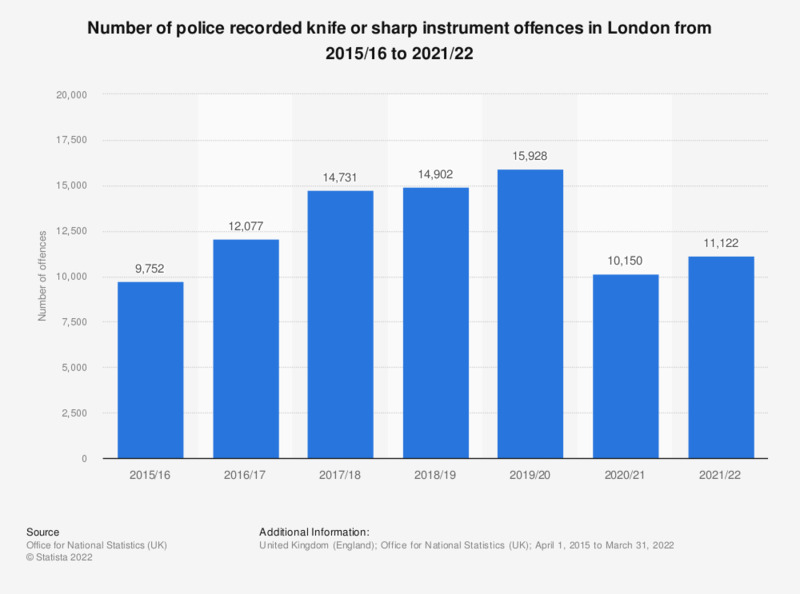 In 2017/18 the number of knife crime offences recorded in London reached almost 15 thousand, an increase of more than five thousand compared with 2015/16. This rise reversed the trend of decreasing knife crime offences recorded between 2011/12 and 2014/15, which saw a reduction of knife crime offences from just over 14 thousand to under 9.7 thousand. The increase in knife crime witnessed in London has occurred alongside a general increase in overall knife crime throughout England and Wales. While there are certainly multiple reasons for this disturbing trend, it is undeniable that the cuts to both police funding and officer numbers are important factors. While knife crime in London has certainly been given a lot of attention by the British media, the increase in acid and moped attacks during the same time period have also generated many headlines. In 2017 for example there were 465 acid attacks recorded by the Metropolitan Police, compared with just 77 in 2012. Moped crime has seen an even greater increase than acid attacks, rising from just over 9 thousand offences in 2016 to almost 24 thousand in 2017. * Figures from the Metropolitan Police. These do not cover the square mile covered by the City of London. Everything On "London (UK)" in One Document: Edited and Divided into Handy Chapters. Including Detailed References. Are you afraid of being attacked or beaten? Do you agree with the statement 'The violence portrayed in Brazilian movies and TV influence the way people behave in real life'? Which of the following could be the reason, why you've been exposed to violent offences and/ or threats?